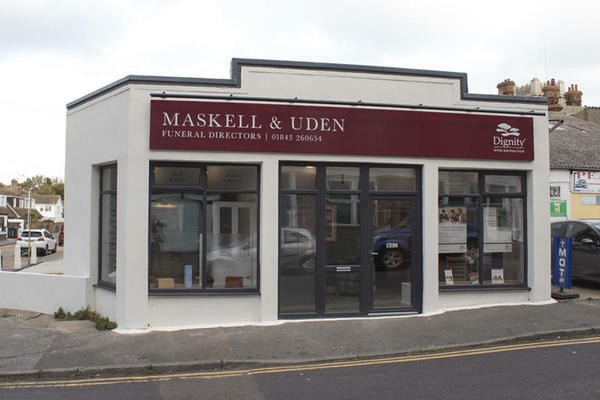 Maskell & Uden Funeral Directors in Westgate-on-Sea provides funeral care and support to the local community. If you have experienced the loss of a loved one, we are here to arrange a dignified funeral in their honour. Our team of funeral directors can be trusted to exercise the utmost integrity while you are in our care. We will ensure that you receive the comfort and moral support you may need at this difficult time, along with offering guidance on the choices that will make your farewell a truly personal one. The knowledge we have gained from our experience over the years, helps us to shape your loved one’s funeral to meet your requirements. Your wishes and those of your family are of the greatest importance to us and we will fulfil them to provide a unique and special funeral for your loved one. We are situated on Cuthbert Road in Westgate-on-Sea, which makes our funeral directors easily accessible to other towns and villages in the Thanet district, including Birchington-on-Sea, Monkton, Minster and St Nicholas at Wade, as well Herne Bay further along the coast. We are here to listen when you need us. Call today and speak to one of our caring team. Call us today on 01843 260654 to talk through your personal requirements. Please give us a call if you would like advice on parking. We can be found on the corner of Cuthbert and Ivanhoe Road. Our staff are available 24 hours a day on 01843 260654 if you require our services outside of these hours. From our first visit through to the last we were treated with kindness, care and courtesy from all those who helped us through a very distressing time. Nothing was too much trouble, no question or query was unanswered and no request was denied. Our biggest thanks goes to Debbie, as without her caring and understanding the whole process would have been a very daunting experience.